I have long heard of the Chinese Wall, one of Pennsylvania’s most impressive geological formations. It is a long, narrow outcropping of conglomerate that resembles a wall. Google satellite shows the formation extends for over a mile. It is very popular with rock climbers. I drove up on a misty day, which actually was better for taking pictures. 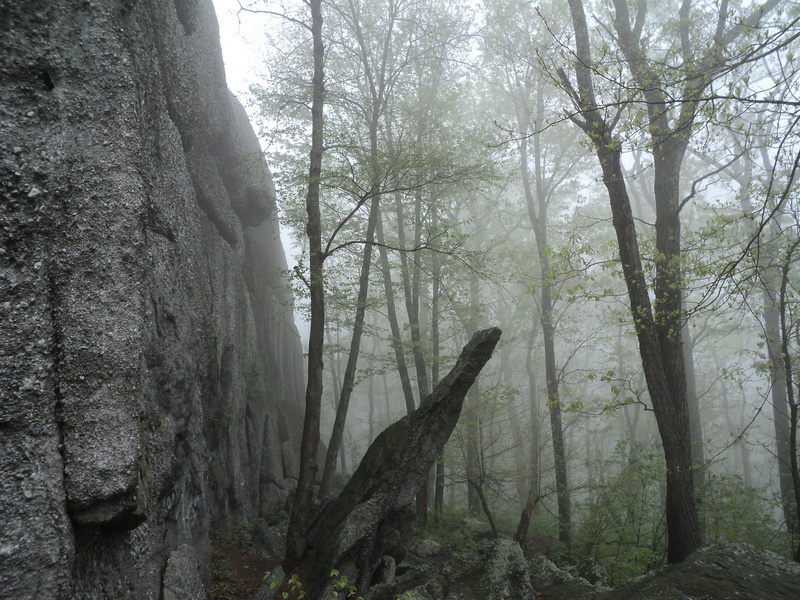 The trees faded into the mist, and a strong breeze swept over the rocks. The formation is also known as Boxcar Rocks, for a series of rocks separated by narrow crevices, resembling boxcars of a train. Moss and especially lichens covered many rocks. I found the rugged parking area off of Gold Mine Road in SGL 211. I followed the gated road for about a quarter mile, and turned right onto an obvious, unblazed trail into a scenic, mysterious pine forest that was shrouded with mist. I soon reached the formation. Unofficial trails snake around the massive wall. I decided to scramble near the top of one of the formations. I crawled through a crevice and walked among the canopy of the blooming trees. I then scrambled to the top, wedging my feet in the cracks. I had to be careful since the rock was a little slick. I reached the top to see waves of mist flowing over the wall. I scrambled back down and explored some more windows, crevices, and passageways between the rocks. Even though it is a short hike, the Chinese Wall is one of the most interesting sights in the state. My next evening sojourn on the AT was to reach Rausch Gap, in St. Anthony’s Wilderness, the second largest roadless area in Pennsylvania. It was a beautiful day. The trail went through some honeysuckle and then crossed a large meadow with some nice views. I entered the woods where there were some campsites. I had to ascend the ridge. The trail was not that rocky; well, I have seen much worse. The trail down to Stony Creek followed an old grade and it was basically rock free. At the bottom were some hemlocks and huge oaks. I then followed the trail up along Rausch Run, a very scenic stream, to the rail-trail. Large boulders filled the creek and there were many cascades and rapids. The trail followed the rail-trail for a short distance with some more big trees. I then began to hike the AT up the glen as the creek announced its presence through the woods. 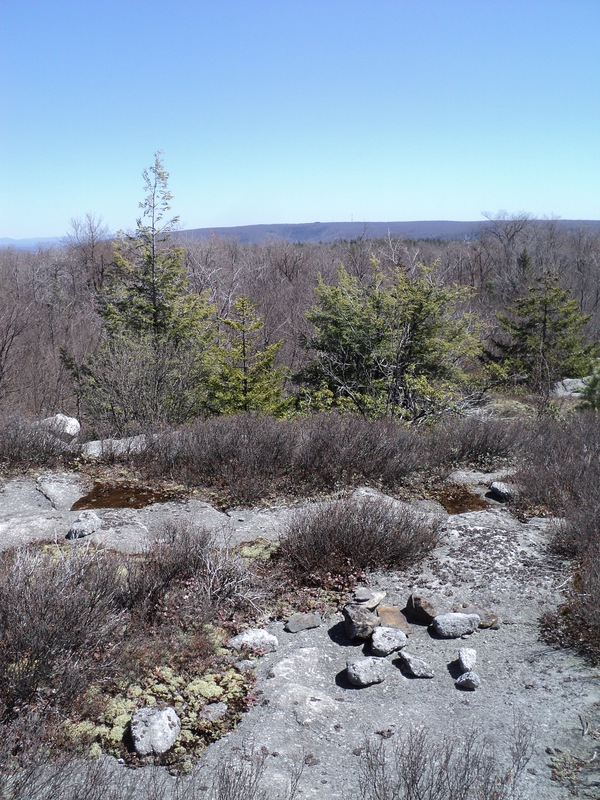 I soon reached a blue-blazed side trail to Rausch Gap Shelter. The side trail followed a level, old railroad grade along a slope of large rocks. I soon reached the shelter, one of the nicest in the state. A spring is piped right to the shelter. I noticed someone in the shelter, he was a thru-hiker from Ohio, with the trailname of “Castaway”. He said he started the trail in Georgia in January. He was previously an electrician and musician, and had relatives who once played for Waylon Jennings. He said hiking the trail was the hardest and most rewarding thing he has done. It was very interesting talking with him, but the sun began to set and I had to get going. I gave him some of my food before I left. I hope he makes it to Katahdin. 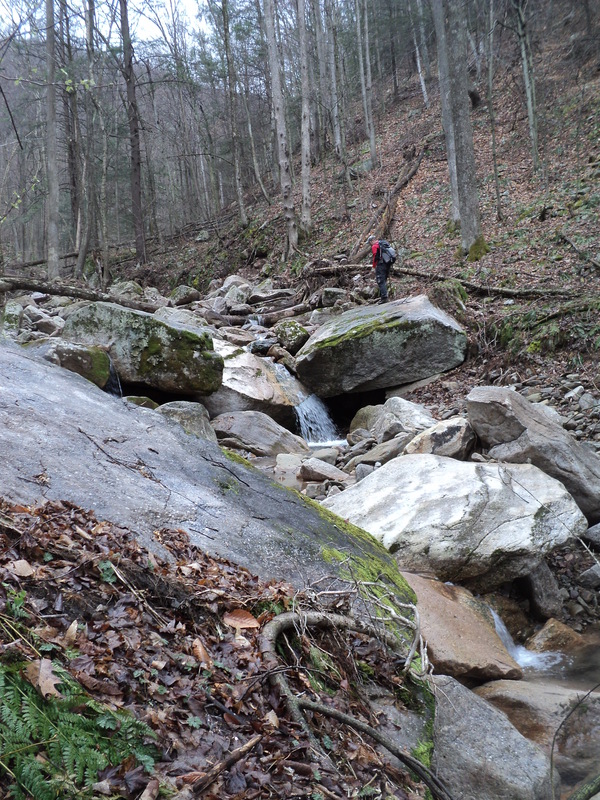 On the way back I followed a side trail along the creek; it was very nice with more large boulders and cascades. I passed some kind of depression in the ground encircled with cut rocks, and the abutments of an old bridge. I made the hike back very quickly, just as it began to get dark, as the setting sun shone on the distant ridges. My next destination was to be a place off of the trail: the Chinese Wall. The other week I attended a conference in Hershey. Every evening after the conference, I decided to hike sections of the AT. First up was Swatara State Park. This park features several miles of Swatara Creek, mountain bike trails, a rail-trail, the AT, and I-81. I parked the car near the Waterville Bridge as the skies threatened with rain; I decided to head north out of the park. I crossed the Waterville Bridge and went under I-81 as trucks zoomed overhead. Under the interstate were some log benches. 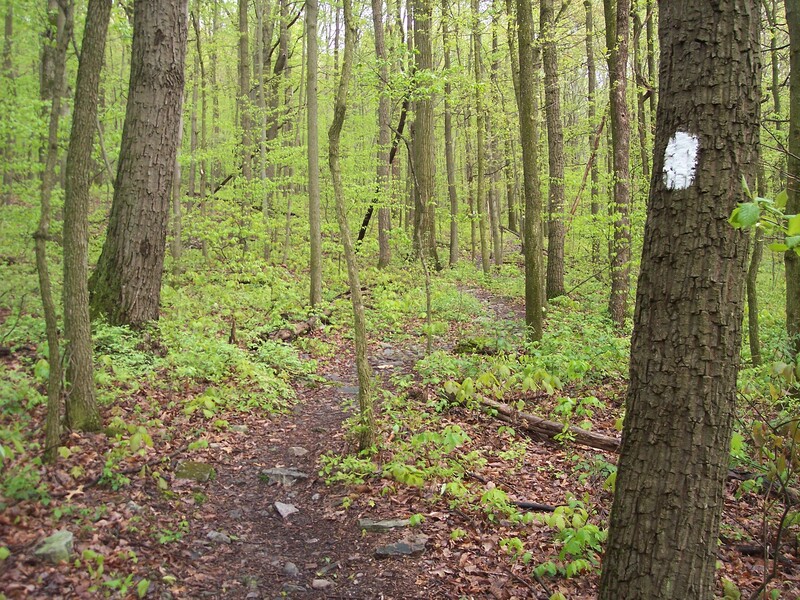 I continued on the trail as it ascended the ridge as the leaves began to bloom, creating a lime green forest. There were some nice campsites along the way. Upon reaching the top of the ridge, I decided to turn around and hang out under I-81. It is not often that you hang out under an interstate. I drank water and had some snacks as the traffic rumbled overhead. Sometimes it’s surprising how much time goes by between cars and trucks. I also read some messages on the log benches, including one from Joe to Lisa who said he missed her and suggested they take I-81 to North Carolina. Facebook may have been more effective. The next day I decided to head south out of the park. This was a nicer hike since the forest was much more diverse with pine, hardwoods, rhododendron, and an assortment of wildflowers. There was also a lot of hemlocks. I passed one hiker, who I’m sure was a thru-hiker by his hobble. I said hi and soon moved on. The trail crosses a road and a creek via a huge fallen log. Next was a boardwalk across a meadow and thick jungles of honeysuckle that filled the air with nectar. 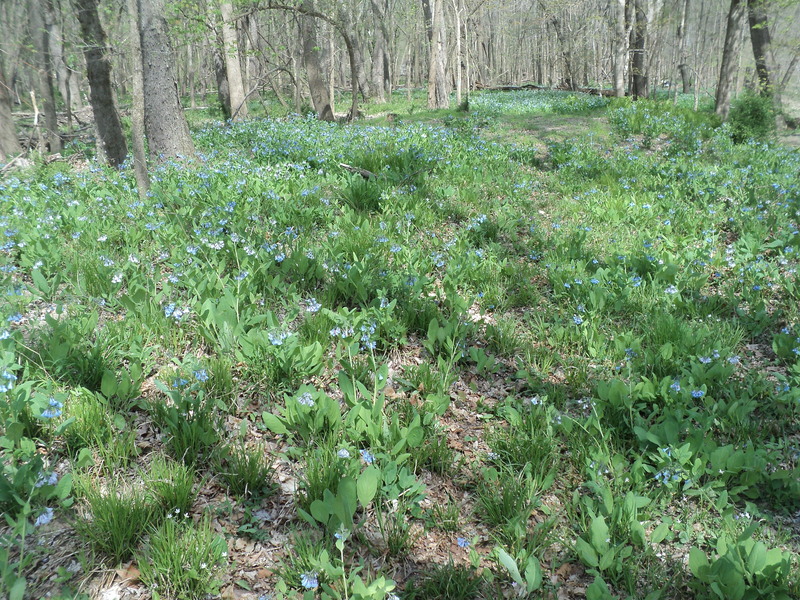 The blooms of dogwoods dotted the forest as violets crowded the trail. I turned around at PA 443. I hoped to give some food to the thru-hiker on the way back, but he was in his tent, talking on a cell phone. I hurried down the trail as darkness descended through rolling, grey clouds. Frances Slocum State Park covers over 1,000 acres and features an 165 acre lake popular with paddlers and anglers. The park was named after a little girl kidnapped by Indians in 1778; it is believed she was initially kept captive in what is now the park. Frances’ relatives never stopped looking for her, and eventually she was found in a reservation in Indiana. Frances was given the name “Mocanaquah”. She died in 1847 at the age of 74, in Indiana. Indiana also has a state park named after her. The park features over thirteen miles of trails that explore woodlands, small streams, the lake, and plantations of tamarack and pine. Mountain biking is permitted and the western section of the park features many stone walls, some are so interconnected, they resemble a maze. We visited the park on an overcast day before an impending storm. First up was the campground, which was surprisingly nice. The sites are wooded with views of the lake and carpets of pine needles. There were even campers from Massachusetts. The Campground Trail was pleasant as it explored pine forests and some rock outcrops. 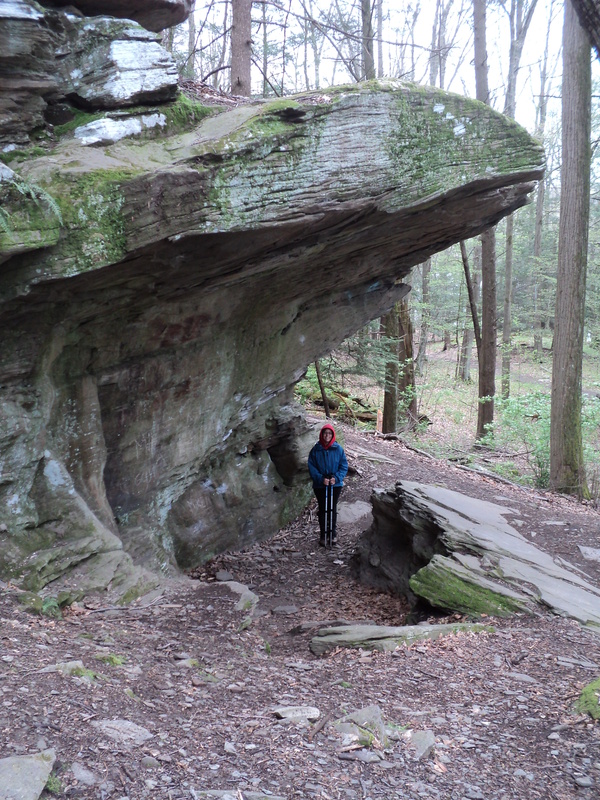 We drove to another part of the park, the more popular Frances Slocum Trail, which follows a series of cliffs and passes a large rock overhang, where it is believed Frances Slocum was held after she was kidnapped. Mayapples were about to bloom and there were several views of the lake. When we finished, the winds picked up and it began to rain, but three bald eagles were gliding over the lake, swirling and riding the winds. 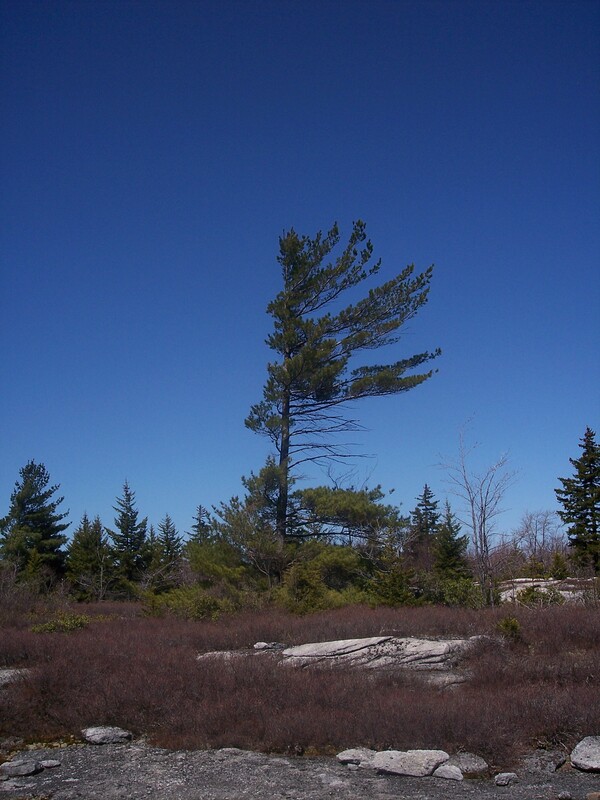 One disappeared into a forest of tall white pine trees. For a few more pictures, click here. The Vosburg Neck is one of the most unique places in the Endless Mountains. Here, the Susquehanna River has created an oxbow loop. While most oxbow loops are created in deltas are aluvial plains, this one has been carved through the mountains. Mountains rise over 1,000 feet above the river, creating a gorge with cliffs. The Vosburg Neck is widely considered to be among the most beautiful places along the entire Susquehanna River. The neck is now completely protected. Half of it is comprised of Camp Lackawanna, a private religious camp that is home to the Endless Mountains Nature Center and over 8 miles of trails that are open to the public most of the year. The nature center is a wonderful place to visit and offers many programs for families and children. You can also visit injured red-tail hawks and other birds of prey, which are cared for at the facility. The other half of the neck is owned by the North Branch Land Trust as the Howland Preserve, an amazing gift to the land trust from Ernest Howland. This preserve features a boat launch and hiking trails are planned. The highlights of the neck are its diverse forests, the river, and remnants of the North Branch Canal, which can still be seen today with its stone canal walls. Wildlife abounds at the neck and it is a popular place for bald eagles and ospreys. Probably the most popular attraction are the bluebells, which bloom in late April. Take the Trail of Blessings down to the river, where the trail explores a riparian forest with massive silver maple and sycamores. There are also several acres of bluebells, creating an incredible floral display. When we were there, it was just past peak, but it is still a sight to see. 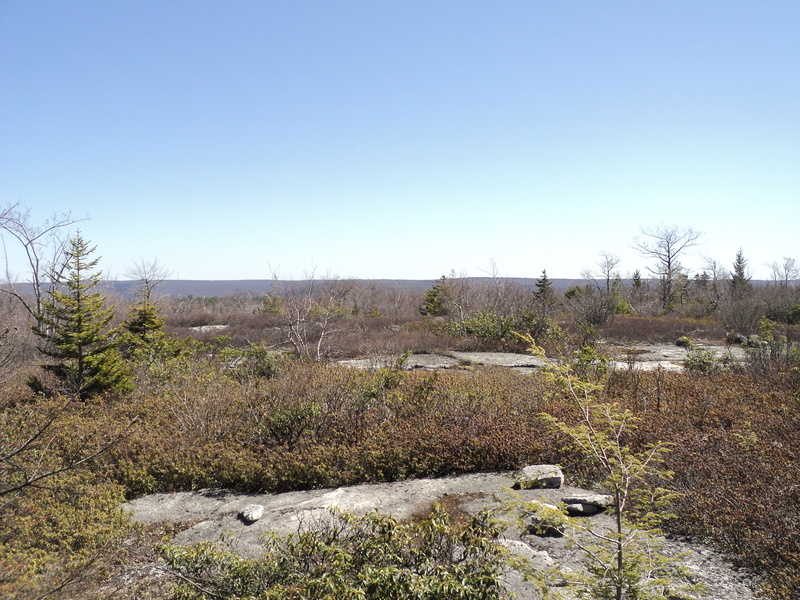 I returned to the Bartlett Mountain Balds on Friday, eager to see them in clear weather. I couldn’t ask for a nicer day. The sun shone through a brilliant blue sky, as the few morning clouds quickly departed. The wind blew in occasional gusts through the trees and over the mountains. I made my way up along Whites Brook, keeping to the grade. I ascended fairly quickly and soon found myself at the top of the mountain. 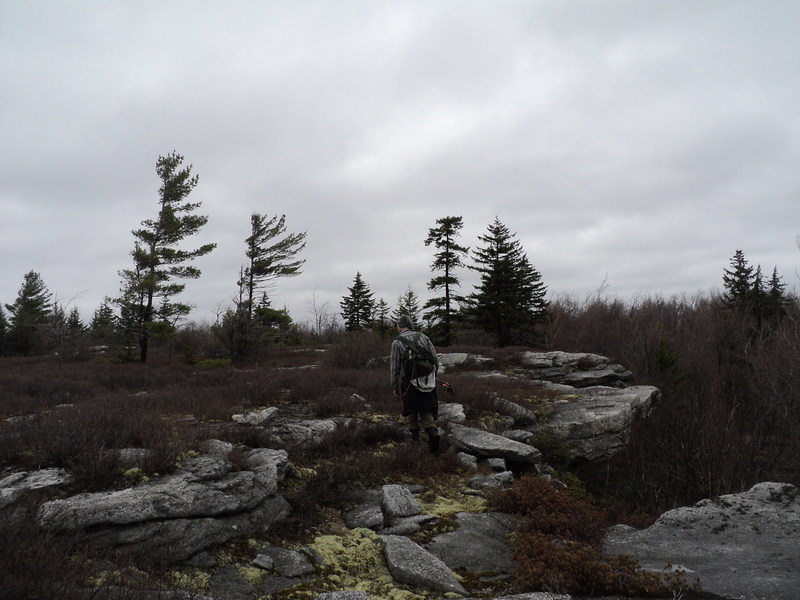 I decided to head towards Big Deer Swamp, and then bushwhack north to explore a series of cliffs. The laurel and fir were thick as I came across some small balds. I decided to keep more south as the cliffs and boulder grew larger. 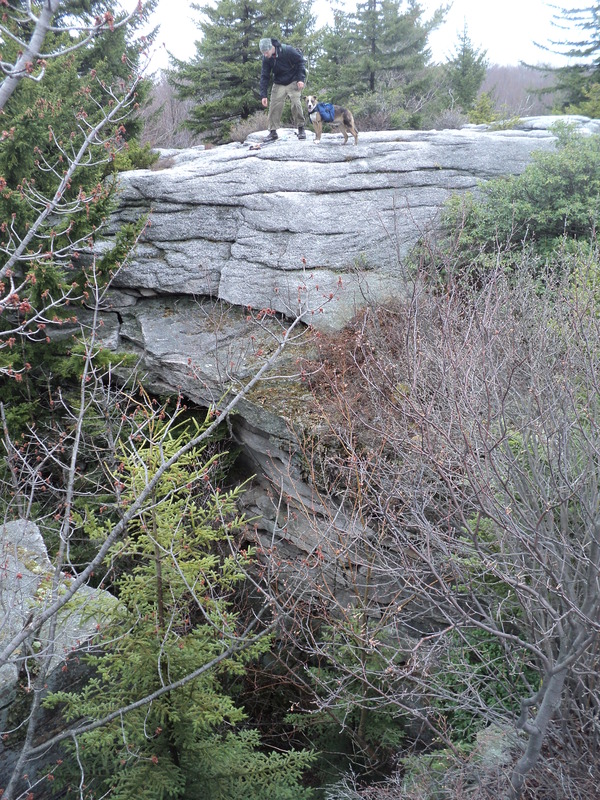 I then explored a huge rock overhang that hung in the air. Several small caves were nearby. Avoiding the mistake from my last trek, I kept north, staying close to the cliff rim. It was a fairly easy hike compared to the prior gauntlet. 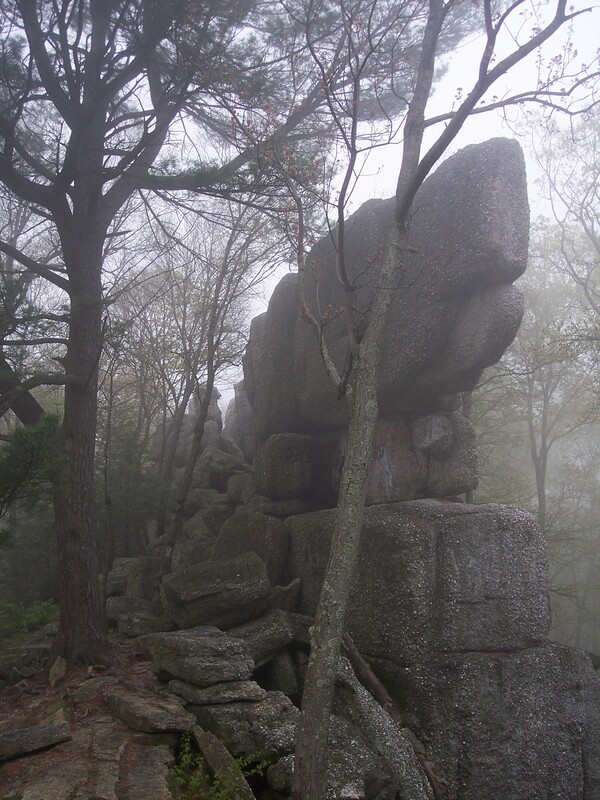 Ledge after ledge rose along the forest floor as fragrant white pine and teaberry cloaked the forest. Game trails weaved from left to right. 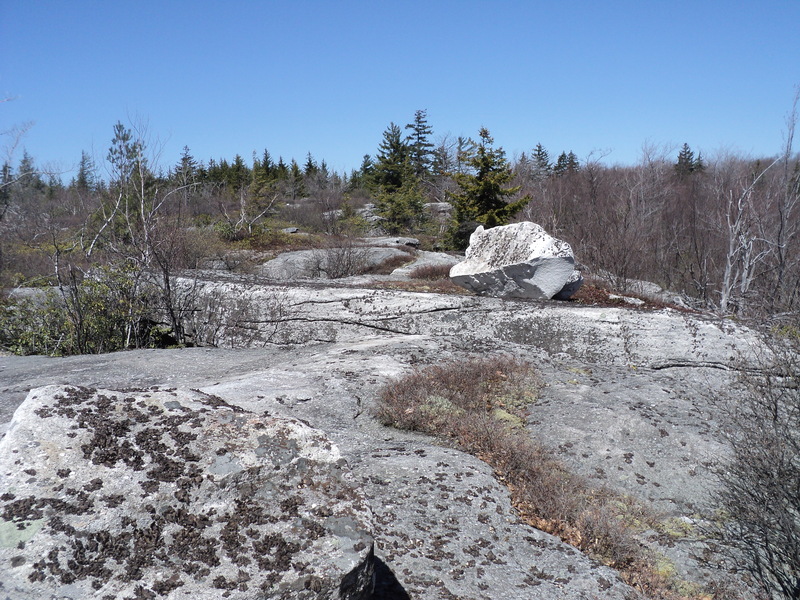 As I continued, the balds began, as cracked white bedrock revealed itself from the undergrowth. 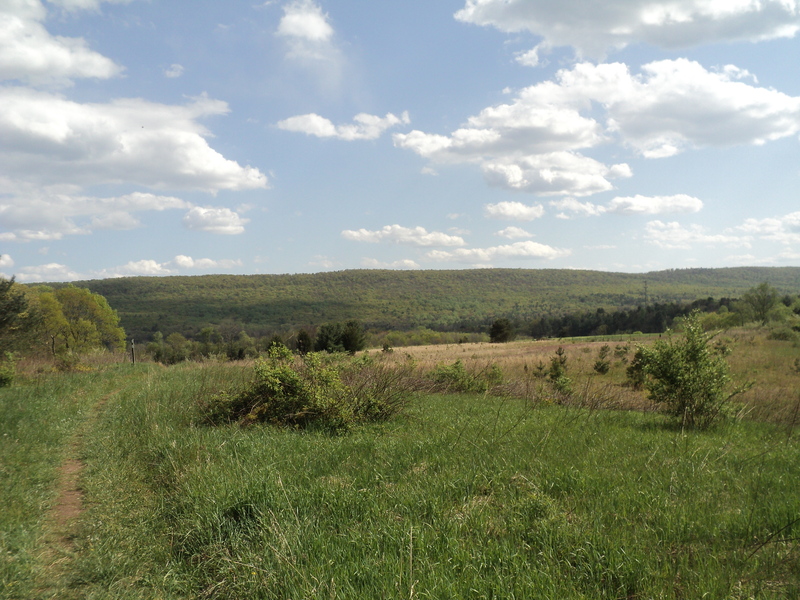 I continued along the escarpment, fighting through some brush and following game trails. I reached the point where we hiked previously. The line of cliffs gradually rose in elevation as spruce and fir became more common. The waxy leaves of teaberry shone in the bright sunlight, concealing their red fruit. As I enjoyed the view from one ledge, I suddenly heard an explosion of activity from a spruce tree 10 feet away- it was a hawk that took flight. The cliff line was unique, featuring incredible overhangs, crevices, and caves. The white rock contrasted with the green forests and deep blue sky. To the east were nice views of Firetower Mountain, and even the double peak of Elk Mountain, thirty miles away. I made may way back, dropping into the forest below. 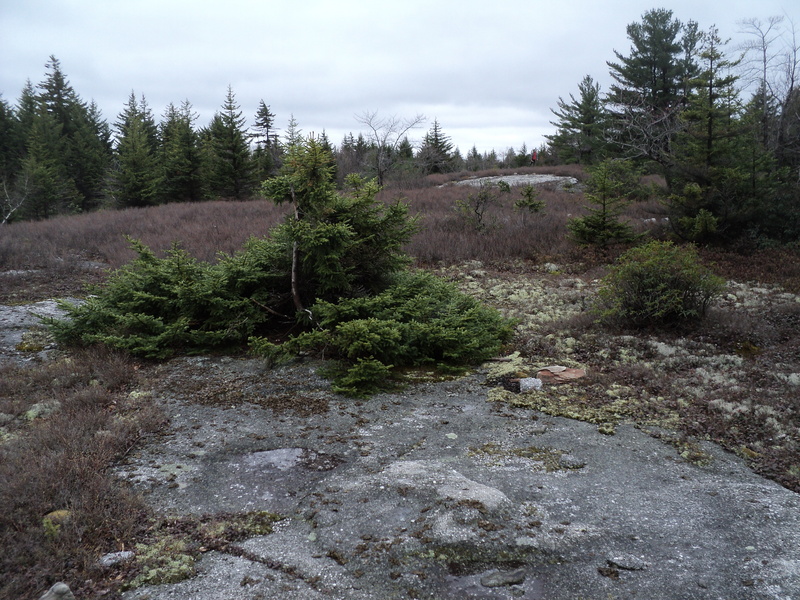 I then took a series of trails through thick hemlocks to some balds on Flat Top, including one I had not seen before. I retraced my steps and returned to the car. 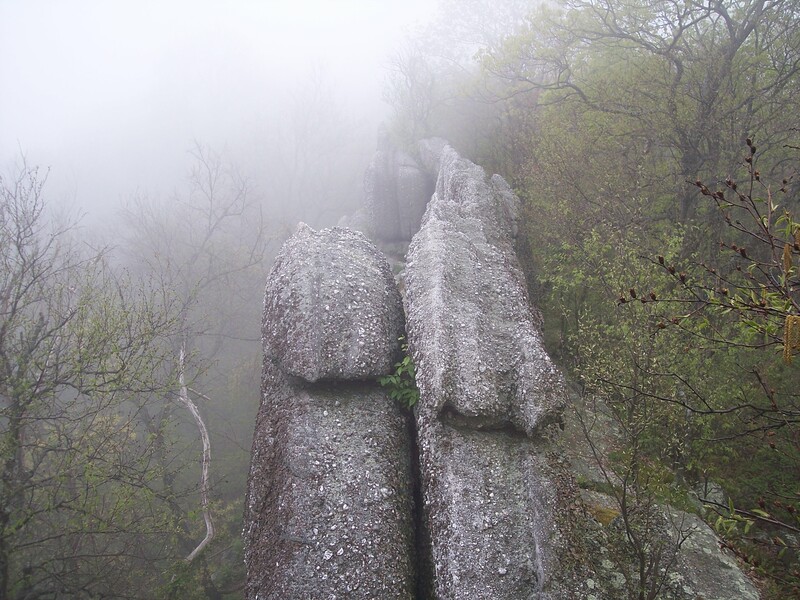 The Bartlett Mountain Balds are one of the most impressive and unique places in all of Pennsylvania. It offers an incredible combination of terrain, scenery, and diversity. Please visit and treat this special place with respect; a tough hike is the price of admission, but it is well worth it. Bartlett Mountain is a section of a vast high plateau that spreads across Wyoming, Sullivan, and northern Luzerne Counties. What makes Bartlett so unique is what lies at the top of it- a series of windswept balds. I have known about these balds for a few years, and this past weekend I was able to explore most of them. It proved to be one of the most challenging, diverse, and beautiful hikes I have ever done, even if the weather did not always cooperate. I met Wes, Ryan and his dog Cali at the gravel game commission trailhead at 8 am. It was a cool and cloudy morning, as fog hung to the higher elevations. We decided to make our ascent via White Brook. The hike began across a meadow and up through a pine plantation before reaching an old forest grade that steeply ascends the mountain. We left the grade and dropped to the creek, so we followed flood-torn White Brook up. We hiked along the creek and traversed waterslides over red bedrock exposed by the floods. The first feature was White Brook Falls, which appeared more beautiful than I remembered. It is about 15 feet high. It spouted down a ledge into a deep pool; large boulders were further down below. 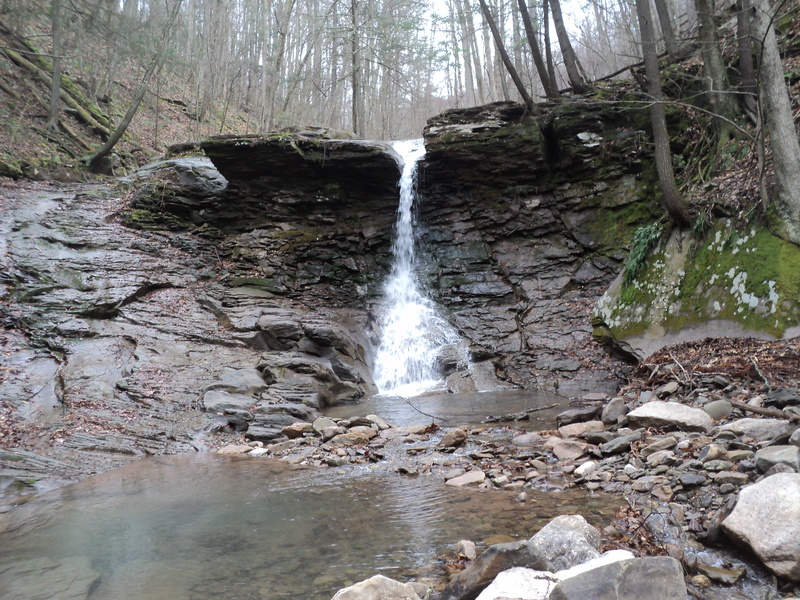 In high water, the falls also features a steep slide on the left. We slowly picked our way up the creek, which only grew more beautiful. The steep glen was filled with huge, white boulders with curtains of small waterfalls between them. Deep pools hid among the jumbles of rock. At times, it felt more like rock climbing than hiking. Our goal was the top of Bartlett, not White Brook. So we eventually left the creek and made a steep climb to a rock ledge with a view through the trees where we took a break. I was sweating hiking up along the creek, but at the ledge it was much cooler as I felt my sweat evaporate into the chilled air. We headed west to reach the top and soon there were cliffs, small caves, and huge boulders. On top was the first bald with a small sign commemorating it to the memory of Tom Sands. 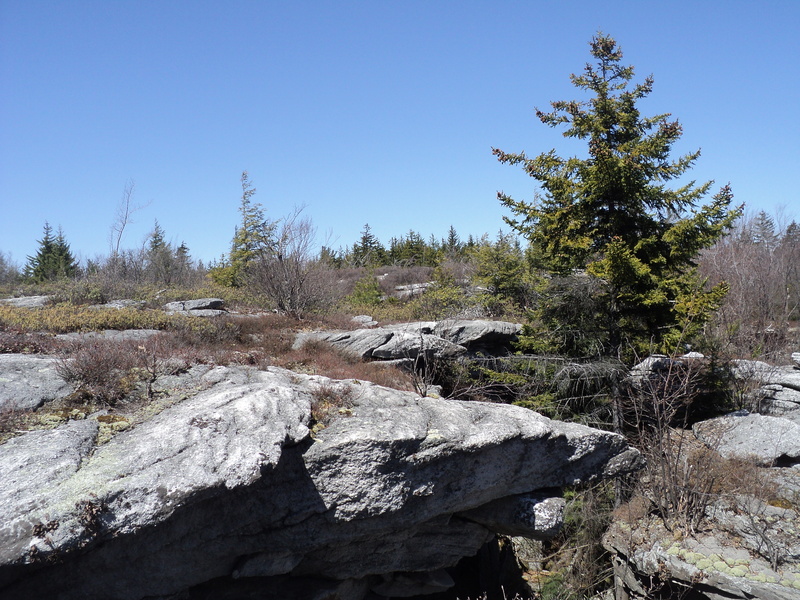 We explored tops of the surrounding cliffs and then headed west to another outcrop, and further west into a thick hemlock and pine forest that was very green with a beautiful scent. Ahead was an even larger bald as some ice droplets began to fall from the heavy, rolling clouds. It is easy to get lost on the top of these plateaus with no obvious peak to orient your direction. I felt we were too far west, and I knew we needed to head east with the hope to find the cliff rim, which we would follow north to more balds. That was easier said than done. The forests were incredibly diverse with white pine, hemlock, spruce, fir, laurel, and blueberry. This diversity also made the forest incredibly thick and at times we spent most of our hiking hunched over, trying to avoid branches as our feet sunk into the sodden carpets of moss. 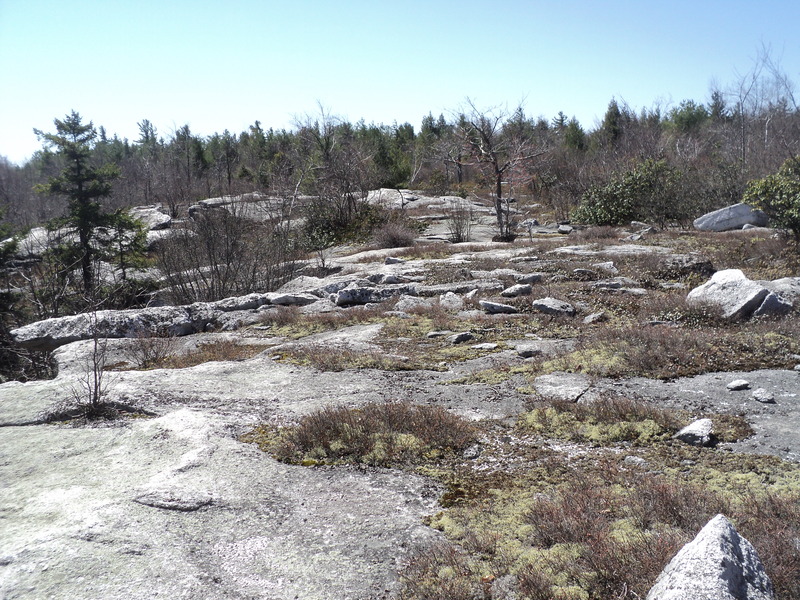 We fought through the forest and reached some small balds where teaberry was trying to grow over the exposed bedrock. Some berries were ripe, so we ate them and enjoyed the sweet, minty taste. We soon pushed on. We fought through the forest again, but it soon became more open. We soon reached the cliff rim as a grove of spruce hid large boulders. Relieved, we proceeded north over the barren bedrock and under windswept spruce and pine. The cliff rim revealed overhanging cliffs, and small caves and crevasses as boulders calved from the caprock of the plateau. The conglomerate was pebbly and bleached white. Thick groves of spruce bunched together as heath-like barrens stretched into the distance. There were some views to Firetower Mountain; even Elk Mountain could be seen despite the clouds and mist, almost 30 miles away. The scenery was impressive, although the weather was cold and raw. Short showers would pass and I soon put on a rain jacket as we got a quick bite to eat. We then headed west, keeping along the north rim of the cliffs. The balds were not as large, but the forest was impressive and diverse. There were also some huge rock outcrops and deep chasms. Hardwoods became more common, but the rocks were still unique. I passed what I call Jigsaw Puzzle Rocks where all these boulders heaved, separated by narrow passageways and crevices- resembling pieces of a puzzle. We also reached a cool overhang and more narrow passages, resembling a maze. The next highlight was Burgess Hollow Vista, offering a wide panorama despite the clouds. Nearby was an old fieldstone foundation. We began our return by following an old forest road. Sadly, someone is turning this into a rutted, muddy track for a big wheeled truck and many trees were cut. This is not allowed on game lands. We made our way back to Big Deer Swamp as the rain showers became more frequent. We moved to stay warm. We decided to extend our hike by heading down Big Deer Run to show Wes the Flat Top Cliffs. This trail was beautiful as it tunneled through thick, healthy hemlock (an increasingly rare sight), crossed a bald, and followed the creek down to a small falls. We left this beautiful trail and climbed to the Flat Top Cliffs. As we traversed the rim of the cliffs, fighting through spruce and fir, the rain fell more heavily. The views were socked in. As we fought through the trees, we became soaked and hypothermia became an issue. We had to keep moving. I had to focus and watch my step as we crossed the tops of the cliffs and crevices. We bushwacked to the east, following the contour around the plateau and passed a huge cliff and a smaller bald. Next was a descent to Flat Top Vista, also known by Ravens Rock, and other names. 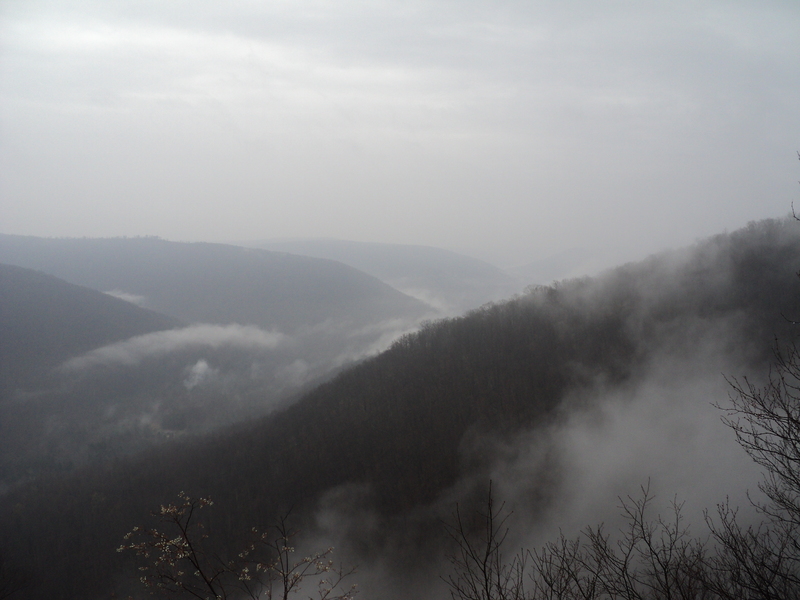 The view was amazing as wisps of fog and mist draped over the Mehoopany Creek Gorge and side hollows. The rain ceased as the fog began to lift towards us. Tiers of mountains dissolved into the distant fog. We soon became too cold from being wet, so we resumed hiking. From there, we hiked down an old forest grade back to the car, bringing an end to our amazing journey. We hiked 14.6 miles. But we still need to go back. The balds would be phenomenal in clear weather, and I realized later that we also missed a series of balds to the south as we fought through the forest. I look forward to my next adventure in the wilds of State Game Lands 57. For a Google satellite image of the Bartlett Mountain Balds, click here.